The objective of this report is to implement a solar electrical system and to provide ample information about installation of PV Panel. This report contains introductory information on solar energy application, Installation Calculation, Electric Connections, grid system, Measuring instruments, experimental setup and experimental result. For installation of PV Panel, There are many calculation to get better efficiency which is explained in detail in the following sections. 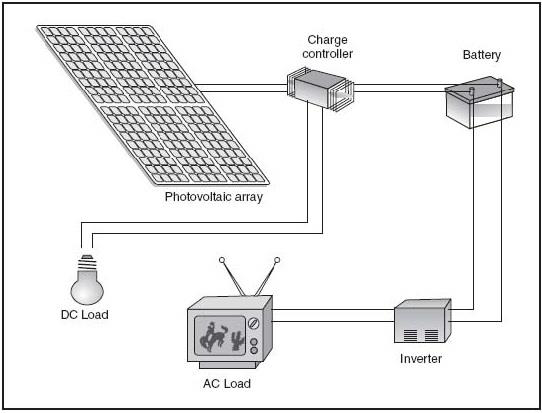 Location of PV Panel is based on daily system energy requirement. Major implementation of this would be in experiment of SATAH. In this experiment two blower fans work on electricity. This electricity gets from solar using solar PV Panel. Also it can be used in rural areas that too for different application. So objective is to install a PV panel in such a way that which would produce ample amount of electric energy for different requirement. Also it can be stored in battery as chemical energy when sunlight is not proper. Calculate Optimum inclination for Solar PV Panel. Investigation and testing of the different components and select the suitable ones which include the different component with their cost effective and durable arrangements. 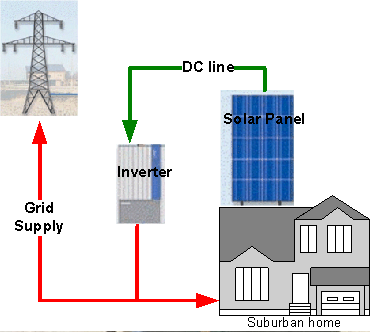 An on-grid or grid-tie solar photovoltaic system is when solar photovoltaic system is connected to a utility source or electric service provider. In this system pay for electricity which is consumed to the utility provider. On-grid solar systems are advantageous as the electricity is utilized by the owner during the day and any surplus is supplied to the grid, some utilities pay for this surplus electricity at a higher rate known as Feed In Tariff (FIT). During the evenings, when solar electricity is not generated, electricity is drawn from the grid avoiding the need for costly battery banks. An Off-grid or standalone photovoltaic system is when solar photovoltaic system is not connected to the utility grid and producing own electricity via solar PV panel. These systems will generally have a battery bank in order to store the electricity for use when needed. Basically, this type of solar system used where no proper grid supply. It is simplest to mount your solar panels at a fixed tilt and just leave them there. But because the sun is higher in the summer and lower in the winter, you can capture more energy during the whole year by adjusting the tilt of the panels according to the season. The following table shows the effect of adjusting the angle, using a system at 40° latitude as an example. The comparison would be a little different for different latitudes.) Each option is compared with the energy received by the best possible tracker that always keeps the panel pointed directly at the sun. In short, adjusting the tilt twice a year gives you a meaningful boost in energy. Adjusting four times a year produces only a little more, but could be important if you need to optimize production in spring and fall. You can jump to the section on the best fixed tilt angle, or skip to the sections on two-season or four-season adjusting. First of all keep in mind that for northern hemisphere solar panel must be installed in south direction and vice-versa to southern hemisphere. If solar panels will have a fixed tilt angle, and want to get the most energy over the whole year, then this section is very helpful. A fixed angle is convenient, but note that there are some disadvantages. As mentioned above, you’ll get less power than if you adjusted the angle. Also, if there is snow, adjusting the panels to a steeper angle in winter makes it more likely that they will shed snow. A panel covered in snow produces little or no power. This table gives some examples for different latitudes. It also shows the average insolation on the panel over the year (in kWh/m2 per day), and the energy received compared to the best possible tracker. If your latitude is between 25° and 50°, then the best tilt angle for summer is the latitude, times 0.93, minus 21 degrees. The best tilt angle for winter is the latitude, times 0.875, plus 19.2 degrees. For summer, take the latitude, multiply by 0.92, and subtract 24.3 degrees. For spring and autumn, take the latitude, multiply by 0.98, and subtract 2.3 degrees. For winter, take the latitude, multiply by 0.89, and add 24 degrees. If solar panel is being gone to adjust the tilt of solar panels in two axis then get maximum output power from solar PV panel. As per requirement and budget, Installation procedure will be decided. According to HPL, Project on SATAH is also economical. So, fixed inclination is very economical for this project. Optimum inclination of solar PV panel for HPL is 17.3° in south direction. Please go through attached report for Solar PV Panel Components Details and Fabrication.